Finding waterfront property for sale in Kelowna can be challenging without proper real estate representation. There are limited lakeside homes available for sale in Kelowna and the most reasonably priced waterfront properties tend to be snapped up very quickly. Once you have decided that Kelowna waterfront is where you want to be, it’s best to get prepared for your next move as early as possible. 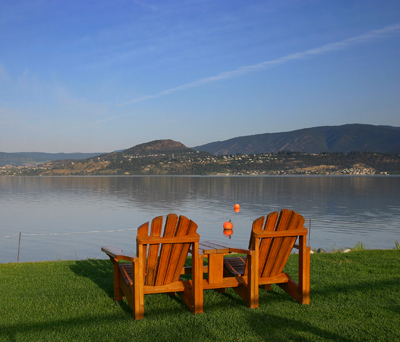 I have a few tips on what you can do in advance to prepare for writing a deal to secure your spot along the shores of Okanagan Lake. Okanagan Lake is 135 km long, between 4 and 5 km wide, and has a surface area of 348 km2. Translation? It’s huge! Which means there are quite a few prime pieces of lakeside property out there to be had – for those with patience. The problem is these sought after parcels don’t come up for sale nearly as often as lakeview or other property types in Kelowna. Generally speaking, once people make it to the lakeside, they don’t have the itch to sell as quickly. This is why I suggest you narrow your waterfront property search to at least three preferred areas of Kelowna. If you’re a local Kelowna resident this might be easy for you to do, if you’re buying real estate in Kelowna from Calgary, Vancouver or from abroad this might prove more difficult, which is why having a local real estate guide can be an immense benefit during your lakeshore property search. The best advice when searching for lakefront homes for sale in Kelowna is to consider your budget first. The more central you are to downtown Kelowna the more the price tags tend to rise for beachfront living. Sandier beaches and proximity to amenities tend to drive lakeshore property costs up. The further out you go to the north (Poplar Point, Sheerwater, Clifton, McKinley) and south (Bertram) the more likely you are to see the prices decline slightly. While you will find some neighbourhoods never fluctuate other than to continually rise (Sheerwater, Fuller Road) there are some where deals can still be found. Crossing over the bridge to West Kelowna (Gellatly, Bear Creek, Fintry) to search for lakeside property for sale can see these exceptions. Typically you will be able to pick up more house for less money across the lake and further north. 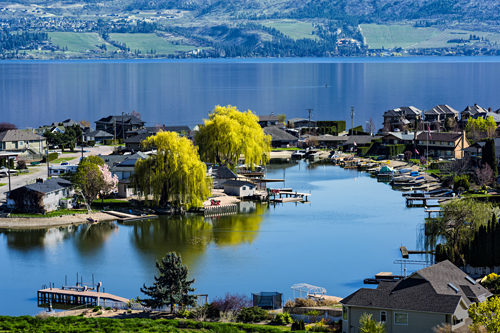 Other things to consider aside from price when you are looking at lakeside communities in Kelowna are the shore type, the distance to amenities and your own lifestyle preferences. There are many areas of Kelowna that have lakeshore properties for sale with sandy flat beaches where you can walk right out your door and into the lake (Abbott Street, Lower Mission). To the north you will discover rockier shores and steeper terrain, but the trade off is generally quieter neighbourhoods, newer homes and beautiful elevated views. Many homes north of Highway 97 have made access to the lake easy with stairs, trams and boathouses that make for easier entertaining during the summer months. Another thing to consider when choosing your Kelowna lakeside neighbourhood is sun exposure. There are some areas that get shade earlier in the day such as the neighbourhoods across the lake in Fintry and Bear Creek. Areas like the Lower Mission and McKinley Landing get a little extra sun exposure during the summer. If sun is a concern you might want to visit the areas at different times of the day to see what your preference is. Many people move into a home for the natural light only to close the blinds all summer long because they’re getting too much sun! Other people buy something out in Fintry only to be in the shade on their dock from 3pm onwards. Having a backup plan is always a good idea especially when you are hunting for lakeside real estate in Kelowna. You’re likely to get a few things on your wish list, but getting everything on your list can be a challenge in this demanding market. Once you’ve narrowed down your top three lakeside neighbourhoods the next thing to do is to dial in your property type and home style preferences. Do you want move in ready? Are you ready to roll up your sleeves and undertake a major renovation? Do you want a traditional home or are you interested in creating something modern? Do you want big views with lake access? Are you worried about stairs? Will you enjoy being in a strata development or are you looking for something private and estate like? Pay attention to these questions as your answers will help you to further dial in your scope of search when finding the right waterfront property for sale in Kelowna. There are a lot of older lakeshore homes that have never been renovated and have been in Kelowna families for generations. When these lakeside properties come available you need to be ready to make an offer and then likely prepared to extensively renovate next. 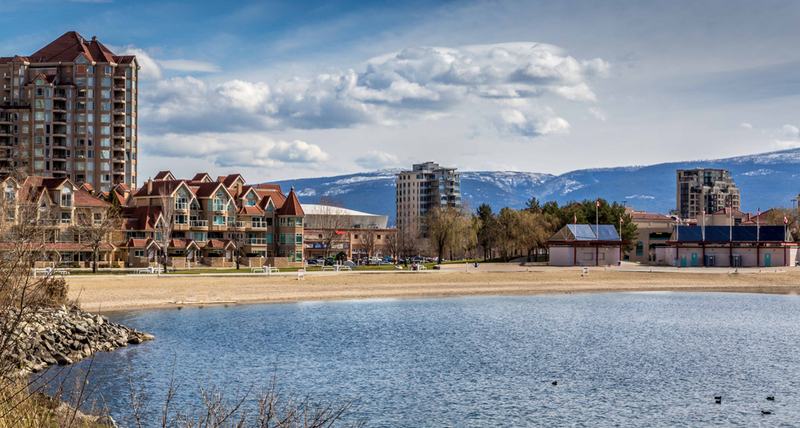 Be prepared that you will have a number of waterfront renovation restrictions coming at you from the City of Kelowna and in some neighborhoods heritage restrictions may also come into play. It’s best to check into zoning ahead of your offer, especially if you are looking in the downtown area to build or renovate your waterfront dream home. Setting a budget is a part of every real estate hunters process, but when it comes to finding lakeshore homes in Kelowna for sale it’s imperative that you have this step squared away as early as possible with some contingency in mind. Depending on how precise you are with your lakeside search criteria will determine the budget you should have set aside. 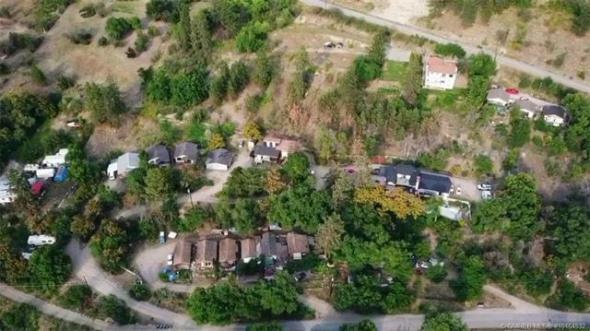 If you know you want a fixer upper and aren’t terribly concerned with the area then you might have some room to move when attaining a waterfront parcel in a great Kelowna locale. If you have specific neighbourhoods, streets and property styles picked out then you could be faced with less flexibility in your budget due to competition and inventory. Keep an open mind, but don’t stray too far from your wish list. You don’t want to be left facing an unplanned renovation with nothing left in your contingency because you blew the budget to get on your dream lakeside street. Be patient, but also remain flexible, sometimes compromising the house style for the neighbourhood that suits you best is worth it in the long run, but you must be realistic with your families lifestyle requirements. It won’t make much sense to live in a lakeside townhome on your favorite street if it only has 2 bedrooms and you have 5 kids and 3 large dogs. I touched on this above, but living on the waterfront in Kelowna can mean that you’re subject to more stringent building codes. You should be informed of this and other costs that arise from waterfront property ownership in Kelowna. Higher property taxes are a given. If you can afford the initial price tag and the costs of renovating, then you shouldn’t be too worried about the tens of thousands you will be required to pay on an annual basis to the City of Kelowna. Living on the lake in Kelowna is considered the most prestigious address in the city and with that privilege, unfortunately also comes the highest property taxes. You will also be subject to more weather. More wind, more water and more chances of flooding depending on your lakeshore location. Prepare to sandbag in the spring if there is flooding and prepare for pumping out water in some areas with low water table. If you are renovating you could also be subject to additional environmental permits and studies especially if you are building from scratch. If you are searching for prime real estate for sale along the shores of Kelowna’s Okanagan Lake and you have done your research then finding your perfect lakeside home with the right real estate agent should be as easy as an Okanagan summer breeze. If you’ve been looking forever and still haven’t found what you’re looking for, then give me a call and let’s discuss your wishes, wants and needs and fast track your waterfront property search.